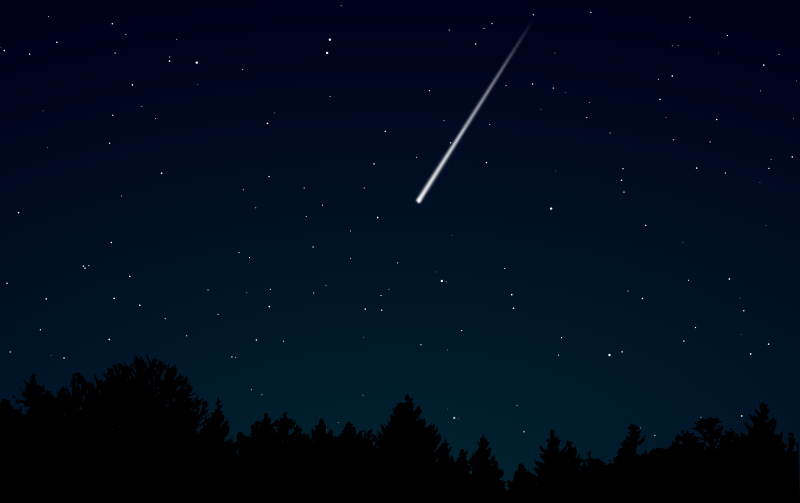 Perseid meteor shower is one of the most reliable and popular showers of the year. It decorates the dark Summer skies every year from July 13 to August 26. The shower peaks on August 12-13 when the hourly rate can reach 60 meteors or even more. In 2018 the shower will occur just after the New Moon, so the shooting stars will be easier to see! Just as the name suggests, the Perseid meteor shower is associated with constellation of Perseus, the Greek hero. This is where the radiant, or the point in the sky from where the meteors seem to be coming from, lies. If you are looking for Perseus on the night sky, another constellation, the famous W-shaped Cassiopeia, will help you find the way. Here is how. Though spotting constellations on the sky is a great activity on its own you don’t need to look at Perseus constellation to see the Perseid meteor shower. Instead, try and get as wide view of the sky as you can. This way you will be able to spot the meteors with longer trails! Bring a friend with you, the more eyes, the better. Find a good spot. You need a dark place away from the city lights, such as street lights, house lights and car headlights, that is not obstructed by trees or buildings. Let your eyes get used to the darkness. It takes about 20-30 minutes for the eyes to fully adjust. Be patient. The Perseids is one of the prominent showers, but if you expect a star show similar to the Bonfire Night or 4th of July fireworks, you are up for a disappointment. Sixty meteors per hour rate means that you will see about 1 meteor every minute. That is quite slow! Choose the right time. The best time to view most meteor showers is after midnight. But young (and impatient) stargazers can try their luck starting from 10 PM. Perseid meteor shower is associated with comet Swift-Tuttle, or 109P/Swift-Tuttle as astronomers call it. Independently discovered by two American astronomers L.Swift and H.Tuttle (we are sure you remember this name, the same astronomer co-discovered comet Tempel-Tuttle, the parent body of the Leonid meteor shower) in 1862, the comet was observed since ancient times. Comet Swift-Tuttle is a periodic comet with a period of 133 years. Its next close approach to the Earth will happen in 2126. Some authors call this comet “the most dangerous object known to humanity”. Even though the journey around the Sun takes the comet well beyond the orbit of Pluto, at its closest point (called perihelion) 109P gets alarmingly close to the Earth. That makes the 26 kilometer wide object the biggest celestial body to repeatedly pass by our planet. But don’t worry, the scientists calculated the comet’s orbit quite well. They say it is not going to collide with the Earth in the next few thousands years. Phew! Watching the shower is absolutely safe too. The bits we will see fall through the Earth’s atmosphere are the parts of the debris cloud that the comet left behind after passing by the Sun. Most of them are the size of the grain of sand. They will burn in the atmosphere well before reaching the ground. Any questions? Please let our inflatable planetarium team know! Visit our space dome to learn more about constellations, stars, planets, moons and other wonders of the Universe.